Do you have a GAP or Banana Republic near you? 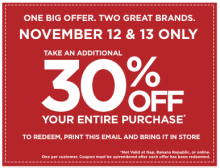 This weekend you can get 30% off your entire purchase with this coupon. 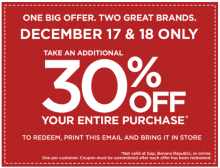 This offer is valid at GAP or Banana Republic Outlet stores on 12/17 and 12/18 only, not valid online. 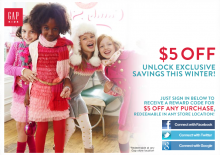 Coupons Dec 17, 2011 in Gap, holiday · Expired! Gap is offering a holiday SURPRISE only at Gap.com! Save up to 40% off on your entire purchase with a special discount code. Head over to Gap.com through this link to get that special code! This offer is going to end on 12/9 so hurry over to check out the deals! Today you can get 35% off your entire purchase at all three Gap Brand stores. This offer is good for online shopping only. Use code: MERRY at checkout. This is a one day sale November 21st only. 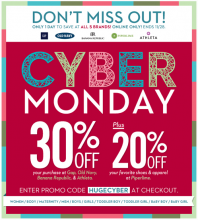 Head over to Gap, Old Navy, and Banana Republic here to check out their new holiday collections and sales! 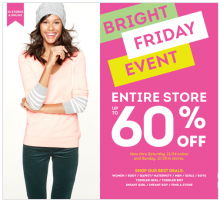 Offers Nov 21, 2011 in clothing, Gap, OldNavy · Expired! Connect one of your social media accounts (Facebook, Twitter, or Google) to Gap and they will give you a $5 Coupon to Gap Kids. Head over to Gap Kids to connect and get your coupon! I am so glad I waited to by a few maternity things! Gap has started their 30% off Friends and Family promotion today and you can save 30% off at Gap.com here with code GAPFRIENDS at checkout. Hurry this offer is going to end on 11/13. Coupons Nov 10, 2011 in clothing, family, Gap · Expired! Every once in a while I’m really tempted to buy something “new” that may not be on sale. I love it when stores put “new” items on sale so I can get the latest at a discount. For one day only, Gap is having a New Arrivals Event. 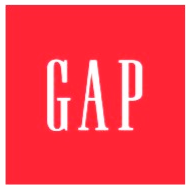 Get 25% off at Gap.com with code GAPNEW at check out. Remember, this is a one day sale. This offer ends tonight at 11:59 ET. Head over to Gap.com and check out what’s new and save 25% off! Coupons Oct 25, 2011 in clothing, Gap · Expired!